You could say that household steam cleaners were built specifically for use on your floor since cleaning such an important part of your home is made more convenient by these tools. Still, buying and maintaining these cleaning aids may drill a hole in your wallet, especially if you don’t know how to clean floors in vinyl type or any other surface properly. The effectiveness and efficiency of steam cleaners more than make up for their high price, but no one in his or her right mind would want to spend on a new cleaner every so often whenever the useful life of his or her previous one ended prematurely. In any case, it pays to know how to clean it using a steam cleaner the right way. This is to prolong the useful life of this nifty device, to preserve the integrity of your delicate floors, and to ensure your own safety. You may already know how to clean vinyl type floors, but before you get started on using a steam cleaner to do just that, you should have the right kind of steam cleaner for this purpose. Although not exactly purpose-designed to be used for cleaning vinyl floors, a general household steamer will serve you well in this regard. The range of available attachments that typically comes with a household steamer means you can use this device for a variety of cleaning purposes. For vinyl floors, the ideal attachment would be a floor head as it could give off just the right amount of heat, thus ensuring your vinyl floors stay intact. Make sure the household steamer you buy has an available floor head attachment in addition to the other usual attachments like extension wands and brushes. You may be excited to start cleaning, but anyone who truly knows to clean vinyl floors using a steam cleaner also knows the importance of vacuuming or sweeping the floor beforehand. Although your steam cleaner’s floor mop can easily pick up residue like hair, dust, sand, and food crumbs, the dampness of the floor head will cause all this filth to build up and leave obvious stains on the floor as you sweep. You can’t say you know how to clean floor properly using a steam cleaner if you don’t follow some safety precautions. DO NOT plug in your steam cleaner before attaching the floor head! These things can quickly heat up and you may end up scalding yourself while attaching anything to them as long as they’re plugged in. There’s also the risk of you literally getting the shock of your life while doing this. Therefore, plugging in your steam cleaner is the LAST thing you should do BEFORE actually cleaning your vinyl floors (or any other surface for that matter). Cleaning with a dirty floor head actually does more harm than good. Not only will it not clean your vinyl floors properly, you’ll also end up spreading filth on your floors (Read item 2.). 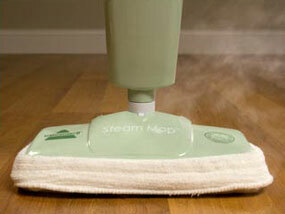 Remember to replace the floor head when needed, and don’t forget to unplug the steamer before doing so! 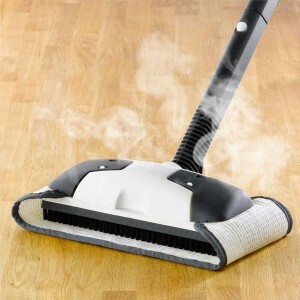 A steam cleaner is a sound investment because it can be used on so many things at home. Just remember to follow these guidelines so that your investment will last for a very long time. Try this tips on how to clean tile flooring.